Click on the dropdown menu to select tones. and it will display the different tones available. You don't need a Paypal account to pay through paypal. You can pay as a guest too. I am your vintage phonograph NEEDLE supplier! Trusted Needles by collectors and enthusiasts across the world! 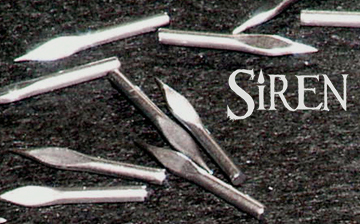 Home of the Patented "Siren" Spear Shape Needle! Hear the difference! I have Soft, Medium, Loud and I sell the "Siren" Spear Tip Phonograph Needle. The Siren is the newest of the tones available. There's no other phonograph needle like it out there. If you cherish your old phonograph and records, this is the place to get your needles. 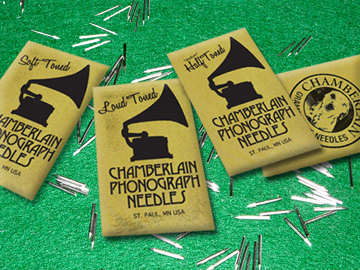 I've been selling my Chamberlain Phonograph Needles to collectors and enthusiasts from all around the world for nearly 20 years from St. Paul, MN USA. The needles I have in supply are made to the specifications of the old time phonographs. They are meant to be played on the old vintage 78 rpm records of the early 1900's. If you have an old Victrola, the phonograph has a reproducer to hold the metal needle, then these are certainly for you and your machine. If you are interested in purchasing my needles, buy them directly above using paypal. You can safely pay using your credit card, check or cash by using Paypal.com. Paypal is a safe way to manage your money and pay for items online. All you need is to set up an account. Over 100 million people use paypal! All metal needles (no matter the manufacturer) are recommeded to be changed out every play of the record, so having a good supply of them is always a great idea! There is no such thing as a MULTI-PLAY NEEDLE. Tones available; Loud is simply the highest volume and can be heard across the entire house. Then Siren is next in volume, Medium and Soft tone being the lowest. Soft tone is perfect for those who live in apartments or condos and don't want to bother their neighbors. Whether your new to hobby or a old-tyme collector, these needles are what you need to enjoy your old 78rpm records. How Do I know which Tone I need to buy? Loud is simply the loudest of the bunch. If you want to listen to the music all across your home, then these are what you'll want. Next is Siren Spearpoint. Then Medium and Soft is the lowest tone you can purchase. It really comes down to preference and how loud you want your music. All needles are made to fit your reproducer, but the thickness of the stem is what makes the needle louder or softer. Is it true I have to replace the needle after every play of the record? Yes. It is recommended that you replace the needle after every play of a record. The reason being, the needle is designed to take the abuse of dragging within the grooves of a record. Once it does an entire trip, the tip wears down. Using a worn down tip will and can eventually cause damage to your old records. So I recommend changing them, no matter who the manufacturer may be. Can I use metal needles on Edison, Pathé and cylinder records? NO! Pathe records are meant for a special sapphire stylus. Edison Diamond Disc records used a specific diamond cut stylus and cylinders were not made for metal needles. You can use metal needles on Pathe "ACTUELLE" records or any record that may have NEEDLE CUT on the label. Metal needles were meant for records such as Victor, Monarch, Berliner, Blue Bird, Columbia, Oxford and other brands of that era. Please read this article about how to use your needles and why they are meant for one use and then discarded. Click here. Victrola needles arrived quickly...even though it was a holiday weekend! Thanks! Instant delivery... Like they were teleported or something ha ha! Work great!! Amazing Seller!!!!!!!! Superfast delivery, thank you so much!!!!!!! Really fast delivery. Good product. First class seller. Got them and they are great! 100% PLEASED WITH THE SPEARPOINT, AWESOME, 5 STARS !!!! Needles sound great. Thanks for the fast delivery. Lots of new needles at very good price. Thanks. The best needles around! Hands down! Fast delivery. Thank you for the great service! Good quality items - fast postage - thanks ! Super needles, great customer service...quick ship...A+ Seller! Great Product at a Great price!! The best!! Highly recommended 5 star seller. Quick delivery. As described. Great communication. Recommended seller of great quality phonograph/gramophone needles! Thanks! I AM YOUR VICTROLA NEEDLE SUPPLIER SINCE 1991! PHONOGRAPH NEEDLES for your old Victrola style phonograph! We ship worldwide. NEW High Quality Nickel-Plated Steel Phonograph Needles... Made specifically for Victrolas, Gramophones & early-time Flat Disc phonograph Records. Made with pride in the USA. They can be used on your antique 1900 model phonographs such as: Victor Talking Machine, Columbia & Grafonola, Silvertone, His Masters Voice (HMV), Vocalion, Brunswick, Sonata, United, RCA Victor, Berliner, Bandmaster, Paramount, Starr, Aretino, Gilbert, Regal, Baby, Blue Bird, Cheney, Chicago Phonograph, Standard Talking Machine, Genola, Zemerphone, Thorens, Olympia, Reginaphone, Standard A, Oxford, Zon-O-Phone, Edison-Bell, Decca, Sonora, Klingsor, and many many more... that play standard flat 78's. NOTE: Never use old or rusted needles on your delicate old records. NOT FOR CYLINDER RECORDS, EDISON DIAMOND-DISC OR EARLY PATHÈ RECORDS Phonograph Information Website: Victor Talking Machine, Victrolas, Columbia, United, Edison, Starr, Sonora, Pathe, Brunswick, Records, Radio, Grafanola, Gramaphone, Graphaphone, Music, PATHÉ, Needles,Reproducers, Minneapolis, STYLUS, chamberlain phonograph needles for sale.